IMPORTANT UPDATE: The What's On Tap 411 app is fully Google compliant. This means it meets or exceeds Google's new (4/21/15) mobile-friendly SEO requirements. The WOT411 app is mobile-friendly, SEO-friendly and human-friendly straight out the box. Your customers can't buy what they don't know about. Your customers buy what they want and they can't want your beer if they don't know about your beer. 7 Questions To Ask Yourself To Determine If The "What's On Tap" App Is Right For You. Do your current customers use mobile phones while they are in your establishment? Do you use a "What's On Tap" chalk board, custom tap handles or some other form of in-house marketing to let your customers know what they can buy from you? Do you think your customers would buy more of your other beers if they knew more about them? 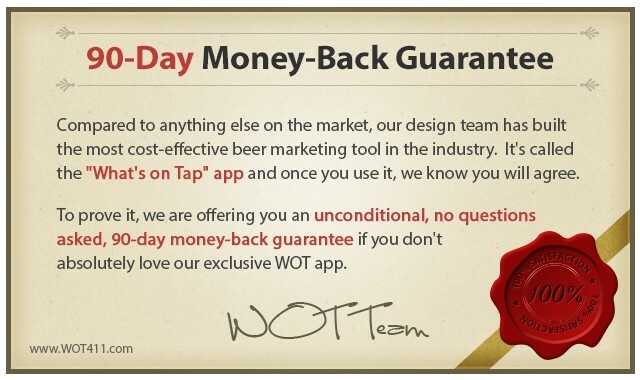 Do you want to make it really easy for your customers to share your beer on Facebook, Twitter and Google Plus? Do you want to make it easier to train new staff members— and get current staff members up to speed quicker when you put a new beer on tap? Do you currently have empty space on your tabletops that could be used to generate more sales? Do you want to spend pennies on a turn-key marketing solution rather than hundreds if not thousands of dollars trying to develop a similar tool in-house?